Tiny RDA from Demon Killer is an extremely mini rebuildable drip tank with easy single coil build deck. Together with a Squonk pin, it also works with most Squonk MOD. Demon Killer Tiny RDA is an extremely smaller rebuildable drip tank with 14mm diameter which is very cute and easy to carry. It features a convenient single coil build deck with two posts and a deep juice well. 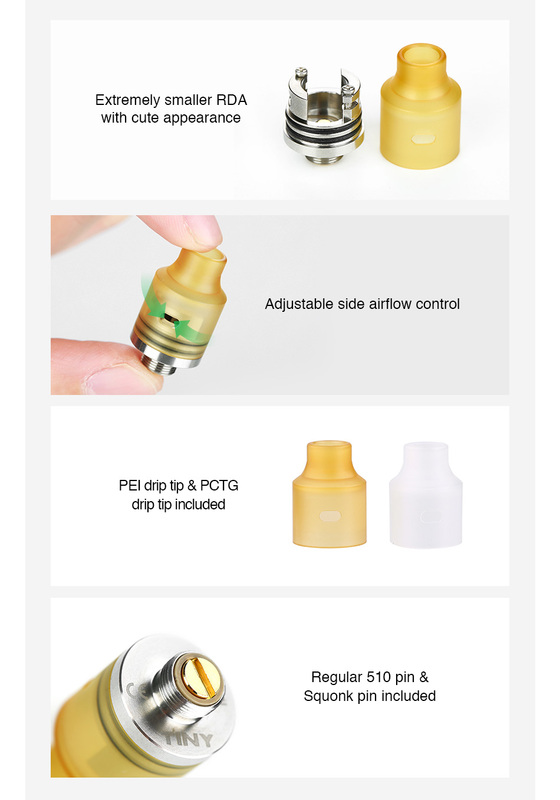 Together with a yellow PEI drip tip, adjustable side airflow control and a Squonk pin(included in the package), it is also perfectly with Squonk MODs such as Tiny MOD and will bring you a surprisingly easy vaping experience.